Although spring is in sight, it is still officially winter, and that means cold and flu germs are continuing to make their way around. I recently had the unfortunate luck to have my first cold during pregnancy, and it was pretty nasty. When you already tend to get very tired, being sick on top of it does not help! I knew that if it got too bad, I could call my doctor, and she would recommend some safe medications to take during pregnancy, but I really wanted to try and stick to natural remedies to keep my body clear of any medicine. The best natural cold remedy that I found was this amazing lemon ginger honey tea recipe. It tastes surprisingly delicious and has some natural health benefits too. There is something wonderful about a steaming cup of tea when you have a sore throat and stuffy nose. The lemon provides a boost of Vitamin C, the honey soothes a sore throat helping to act as a cough suppressant, and both the honey and ginger are thought to have immune-boosting properties. Plus, ginger is a natural antidote to an upset stomach, so if you are still stuck in the all-day morning sickness phase, this tea may offer some relief of those symptoms as well! 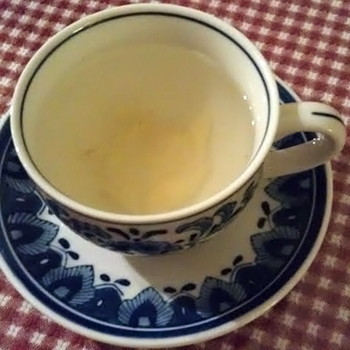 Dice the ginger into medium-sized chunks, and add five or six pieces to the bottom of a tea cup. Pour boiling water over and let steep for about five minutes. Squeeze in the juice from one wedge of lemon. Add approximately one teaspoon of honey and stir well. Note: I left the ginger in my cup to continue steeping as I drank. It is heavy enough that it mostly stayed at the bottom of my cup. If you prefer, you can remove the ginger pieces after it steeps. You get the idea. These things are recommended when you are sick — pregnant or not — and for good reason. Rest and fluids can do wonders for a tired, sick body. 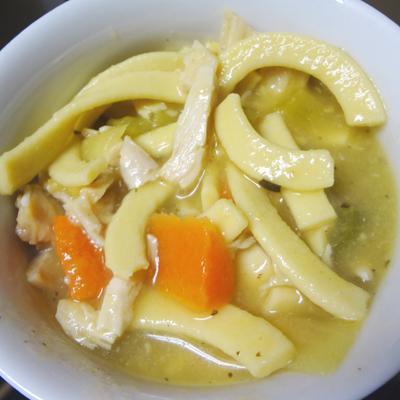 Okay, it’s a little cliché, but chicken noodle soup provides an additional serving of clear liquids from the broth, protein from the chicken, and vitamins from the veggies. Hey, it can’t hurt! This particular bowl of delicious chicken noodle soup came from Costco. They sell containers of homemade soup made with their fresh rotisserie chicken. Yummy! To make your own, segment an orange and a grapefruit. 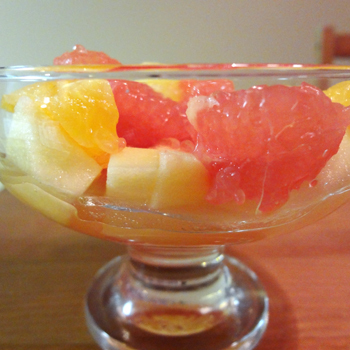 Place in a bowl with some canned diced pineapple and a diced apple. Enjoy! Although you have to be careful about enjoying a very hot shower or bath during pregnancy, you can still get the benefits of steam in dealing with cold-related congestion. I like to let the shower run hot for a few minutes to steam up the bathroom, and then turn the water temperature down before getting into the shower or filling up the bath. That way, I can breathe in the steam to help clear out my congestion without putting my body into the hot, steaming water. For baths, my favorite products are from Lush. 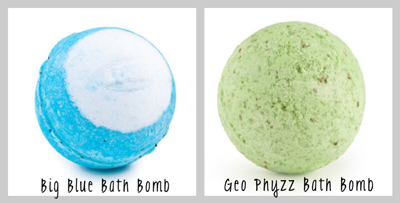 Their bath bombs and bath melts are fabulous, and there are even a few bath bombs that are perfect for a stuffy nose: the Big Blue Bath Bomb and the Geo Phyzz Bath Bomb. The fresh herbal scents are lovely for a stuffed-up nose. Remember to listen to your body. If the water or steam feels too hot, it probably is. 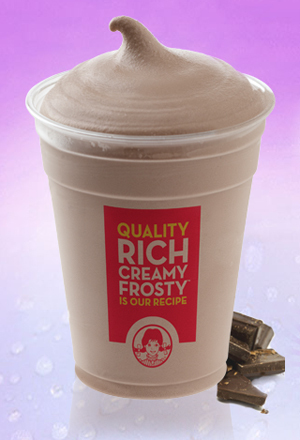 Let things cool down before you enjoy. Hopefully you will not have a need for any of these cold remedies, but if you do, I hope that they provide you some comfort and relief. I know they made things more manageable for me. Here’s to the end of cold and flu season! Note: I do not have any medical training. Please check with your doctor before beginning any course of treatment. Any products shared in this post were not sponsored, and reviews are my own opinions. Sarah and her husband, Britt, live in Glen Allen, Virginia, and are expecting their first baby (a sweet girl!) in June 2013. Sarah is a kindergarten teacher and has a home-based business, both of which keep her very busy. She unwinds by sharing her adventures in cooking, decorating and life on her blog, A T-Shirt and Pearls.